Last week I went into some of the sub-genre’s that can found under Steampunk. This week I decided to take on the challenge of diving into one of the sub-genres, I slightly regret it now. Perhaps it may be my research capabilities and I think I may have to refine them slightly, but I found it difficult to find anything about Clockpunk that I had not discovered last week. So where does one really start with an article where there has been little information found? Let’s repeat the definition of what Clockpunk is, in case you missed last week’s article. Clockpunk is a version of how our historical world would have turned out if certain technological developments that occurred later in time had happened in the Renaissance and or certain inventions during this time were created on a mass scale in the time period. It is all about creating thing pre-industrial revolution inventions, i.e. those that run off of the sun, water or spring powered gears. It can be slightly difficult for new comers to see what the difference is between Steampunk and Clockpunk. It is easier to see how there can be some confusion about the two. If you were looking at two lovely individuals dressed up in Steampunk and Clockpunk, it could be a challenge to distinguish between the two if you were not overly familiar with the two eras. Also, both Steampunk and Clockpunk can rely heavily on cogs and gears, remember that we are trying to create things without showering them with gears. I believe that the easiest way to distinguish between the two, besides they are into two separate points of time, is that Steampunk is all about the steam and Clockpunk is most definitely not. There is no combustion in Clockpunk and there for there is no steam. If we could look at just one historical figure that would resonate with what Clockpunk represents than that would have to be Leonardo Da Vinci, at least in my opinion. Not only did he live during this period of time, the Renaissance, but he was also an ingenious inventor that was ahead of his time. If one was to look at his drawings, I highly recommend that you do so, you would be able to see many examples of inventions that were meant to run off of clock works, spring power, sun and water. He is sited, from my quick and light research as one of the main examples used within the Clockpunk genre. This article has caused me to want to dive deeper into not so much of what the Renaissance was, also known as the period of enlightenment, but more about the inventors of the time. If you haven’t noticed, I really don’t focus on the fashion and I probably never will, sorry Fashionistas. I would like to come back to Clockpunk at a later point; mainly after I have done some deeper research into Renaissance inventors and publish a deeper look into what projects that could be used for Clockpunk for you, my lovely readers. Also, I am noticing that the projects I have planned for around the home, are a mixture of a lot of the punks, not just Steampunk. For example, the guest room will be Clockpunk versus the Library that will be Steampunk versus the Living Room that is going to be Mythospunk. 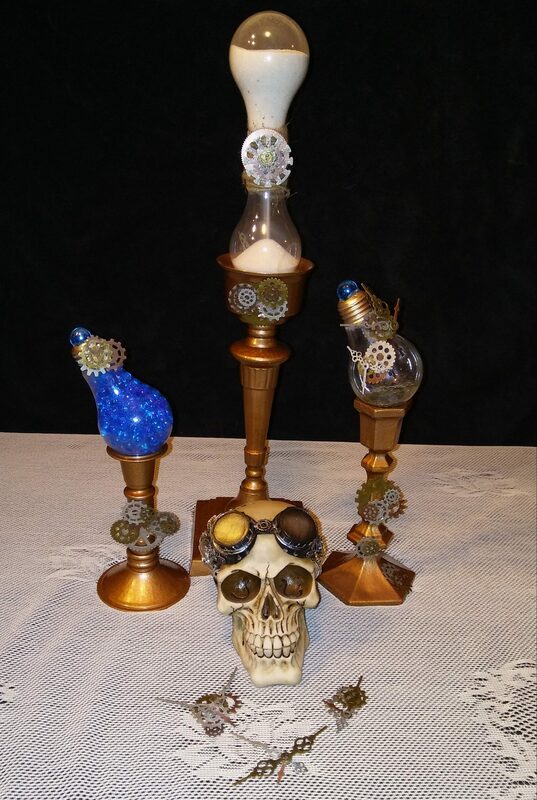 So I may have some easy Clockwork projects coming up for ya’ll.